I've been working on an Iron Age Celtic farmstead diorama for about a year now. 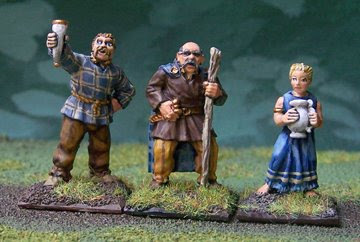 Black Tree Design offers several very nice "Celtic Folk" sets. I have painted 6 characters so far. 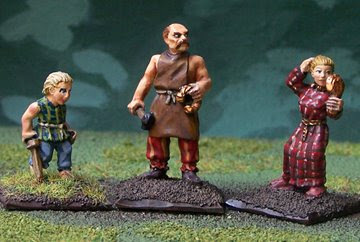 The models have distinctive Celtic details such as the mustaches, the anthropomorphic-hilt dagger held by the old man, the bronze mirror held by the woman, and the torque held by the smith. They are all mounted on 20 x 20 mm sheet styrene. I like to bevel the edges with a blade, rather than leaving them perfectly square. I have a keen interest in Iron Age agriculture, so I expect to post alot of photos of painted, sheep, cows, scratch-built farm houses, etc. Peter Connolly's Greece and Rome at War features a chapter on Iron Age celtic arms and equipment. Miranda Green's Celtic World is an excellent reference for all aspects of Iron Age Celtic society: military, daily life, technology, etc.